10 Easy Changes To Help You Lose Weight - Something New Everyday! We all know that being overweight can cause serious health problems. Many of us don't always have the time to exercise and that, in part, leads to the high obesity rates we see in the western world. At the moment, adult obesity rates in western countries has climbed to record levels, passing 25% of the population - that's one in four people! What many people don’t know is that by making ten minor changes in your daily routine, you can start losing weight quickly. Stress is the enemy of caloric-burn. A stressed body reduces the amount of calories it burns and changes the way it metabolizes food. A recent research at Ohio State University showed that women who report stress burn an average of 100 calories less than women who weren’t under stress. Consider doing Yoga, as it both helps you relax and burn calories. Keeping the room temperature between 16–25 °c (62-77 °f) forces your body to burn calories in-order to warm up. If you drink cold water, you’ll burn 25% more calories than if you drink room-temperature water. Most nutritionists recommend splitting your meals into smaller ones throughout the day.. The Journal of the American Diabetic Association reports that a recent study found that a mid-afternoon snack works better than a mid-morning snack when trying to lose weight. By switching hands, you’re more ly to eat less - a finding reported by the University of Southern California. The reason is that much of our hunger and eating is based on habits. By breaking these habits we become more aware of what we’re doing, and reduce the automatic eating patterns we've developed. Yup, don’t eat them, just sniff them! The smell of bananas and green apples suppress appetite just how sizzling steak or fresh bread awakens it. Scientists aren’t sure why it happens, but the common theory is that taste is 90% smell, so smelling food confuses the body into thinking it’s been eating. A research in Brigham Young University found that women who exercise in the morning are less hungry and more physically active. However, the hunger-suppression effect only lasts while the body temperature is high (which happens when you exercise), so you should also perform small workouts throughout the day (take the stairs, walk home, etc.) to maintain a higher body temperature. Women tend to be more self-conscious around man, leading them to eat less by an average of 100 calories. The University of Cornell found that, on average, people will eat 50% more food if it’s labeled “low fat”. The researchers believe that it’s a psychological effect – you see a food is “healthier”, so you feel you can eat more of it. When you see a product with “low fat” or “diet” written on it, eat it as if it’s full fat and you’ll start shedding away your weight. 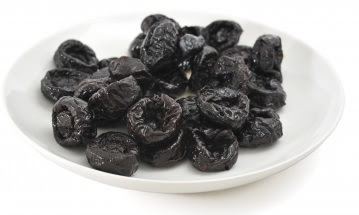 Eating 5-6 prunes a day helps you lose about 4.4 lb (2 kg) in 12 weeks. This was found by the University of Liverpool, and the researchers are speculating that the weight is lost thanks to “increased bowel activity”, but without any adverse effects.. So, add prunes to your diet, your body will thank you for that. Proteins take longer to break down compared to carbs and fat, forcing the body to increase its metabolism rate by 20%. The slow digestion also means you get full faster and stay full for longer periods of time. So add an egg, a piece of chicken or fish, or some lean beef to your meal - it will give you plenty of protein, with a diet that doesn’t feel a diet!